With temperatures dipping down to -17 to -30°F throughout the region, winter injury was inevitable. The winter’s extremely cold temperatures have left most of the Lake Erie grape region in a varied state of damage. V. vinifera cultivars suffered the majority of the loss/damage with many ‘hybrid’ and ‘native’ cultivars also suffering winter injuries. As the growing season progresses, the apparent bud and vine vascular damage can be seen by dead or stunted shoots on injured vines. Depending on the severity of the damage, growers are taking action by replanting dead vines or renewing vines/trunks that have suffered damage. Figure 1. Winter damage on a ‘Niagara’ vine (A) damaged phloem (B) combination of dead buds (blind nodes) and stunted yellowed shoots (C) brown streaking indicating xylem damage. With bloom closely approaching all trunk and cordon vascular tissues (phloem, vascular cambium, and xylem) should be functioning in full force. Trunk damage occurs from the outside in; making the phloem first tissue to show sign of injury. Damage to the phloem (Fig. 1A) will prevent the flow of carbohydrates needed for shoot development. Damage to xylem (Fig. 1C) will restrict flow from the roots to the canopy resulting in stunted, coloristic (yellowed), or dead shoots (Fig. 1B). Phloem and xylem damage can be assessed by cutting a shallow strip off of the trunk, cordon, or canes and examining the amount of browning. Figure 2. 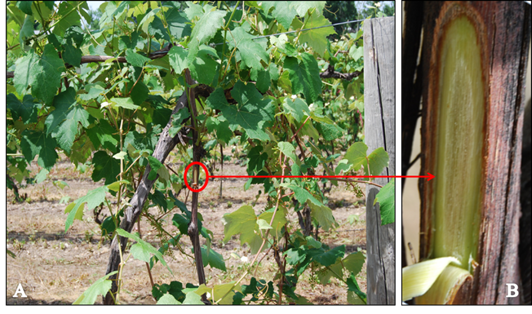 (A) Healthy ‘Niagara’ vine (B) shallow cut exposing phloem and xylem. In cases of severe trunk damage, the xylem and phloem no longer function and the vine can collapse (Fig. 3A). Vine collapse occurs when expanding leaf size and overall canopy size demand more water than the trunk can supply. Timing of vine collapse is unpredictable and can even happen the following growing season. Depending on the location of the vascular damage, ‘partial vine kill’ can occur on one side of the cordon or select canes. In cases of partial vine kill, vines can be managed by pruning out the affected areas. However, when there is obvious or suspected trunk or cordon damage, suckers should be retained with the purpose of vine or trunk renewal. The overall goal of trunk renewal is to balance the amount of living tissues above ground with the potential of the roots below ground. Figure 3. Sever winter damage to ‘Pinot gris’ (A) vine collapse (B) stunted shoots with chlorosis. Trunks should be renewed on any vines that are suspected of trunk injury. Protected below the soil line, root systems are generally unharmed by winter injuries and readily supply carbohydrates to the awaiting plant tissues above ground. When there is trunk damage, hidden buds at the trunk base awake from dormancy and produce ‘suckers’. A vigorous eruption of suckers has long been a sign of trunk damage, and the typical response from most growers is to save the sucker to replace the existing trunk which renews the vine. The amount of sucker and fullness of canopy are cues for guiding decisions on how to balance the vine. If viable, 4 to 6 suckers should be retained to balance the root support when the canopy is severely stunted and or showing visible nutrient deficiency. In vines that have full canopies and produce large vigorous suckers, only 2 to 4 suckers should be retained to obtain balance. Although balance is difficult to put into words, a different decision will need to be made for every vine. The goal of vine renewal is to manage the existing root structure with the amount of living plant material above ground.